This was my first column for Cakes & Sugarcraft, so featuring my first ever cake. Welcome to my first column. How to greet you? Well if we were at home I would probably be pulling some fresh muffins out of the oven as close as possible to your time of arrival. There is nothing like a house smelling of fresh baking to give you the feeling that your visit matters, that it justifies more than a scrabble round the back of the cupboard for a half crushed pack of supermarket bourbons. I would want to make you feel happy to stay, to sit and unwind and chat. But how to do that in print, so that you pause, sit down with your cup of tea and get to know me? Well maybe I should start with telling you a little about myself, how I came to love baking and what I will be writing about in this column. My parents have called me Cookie for as long as I can remember, and what started out as an endearment, became prophetic as I spent more and more time at the stove. First at their big range cooker, glued to their sides. Both my mother and father are fantastic cooks, so I tried to glean all I could of their undeniable skill and wisdom. Later when I took my first faltering solo ventures into the wonderful world of making food the passion stuck. What joy! What alchemy! A little effort and the results could be eaten! Such a feeling of productivity and creativity, and the satisfaction of all the senses. The smell and taste of course, the sight and feel of the new-made thing. Even the sounds of cooking are music to me; the thump of kneading dough or the rhythmic click of a whisk on the side of a ceramic bowl. There is no question that my first love in the kitchen is baking. For me there is no more satisfying demonstration of the glorious chemistry of cooking. The way the simple mixing of a few ingredients, the application of a little heat, can result in an entirely new creation. And of such infinite variety! From the humble; an unleavened bread or a cookie, to the elaborate and elevated; the heights of French patisserie or the finest multi-storied wedding cakes. They are all made of some or all of the same basic list of ingredients, flour, butter, eggs, sugar, a little help in the raising department maybe, the addition of some enriching ingredients for variety and taste sometimes. But they constitute a world of possibilities from a small cupboard and a little corner of your fridge. What is not to love! Then I gained a stove and home of my own, with kids also keen to commandeer the wooden spoon. Their interest, and the constant round of birthdays, tea-dates, and puddings required, well any excuse really, kept me whisking and stirring, tasting and perfecting in a happy fug of flour and vanilla scented fumes while contemplating smiling faces. The drive to taste and create the best in all that is baked has never left me. Happily I had a houseful of very willing mouths to feed. But nonetheless I found myself baking for an ever-growing audience. I was always the one ‘bringing pudding’ wherever I went. More than happy to do so, gratified at being asked. As the requests became ever more frequent, and the commissions ever larger, money even started to change hands and I found myself an accidental expert of sorts. But to put that straight, and so you know what to expect, I am resolutely a domestic cook. Untrained except by my own unstoppable curiosity, and a palate that I take delight in testing at every available opportunity. And so I come to my place here in your magazine, to be in my home kitchen just as you are, to bring you the results of my culinary travels thus far, and to keep you with me as I bounce into the future, mixing bowl at the ready. 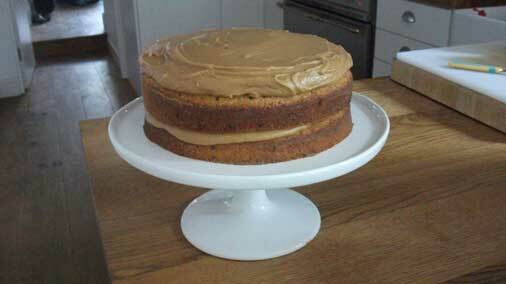 For this, my first issue, I thought it appropriate to share with you my first ever cake; Iced Coffee Layer Cake. Made as a child time and again. Gleaned from my first recipe book, the pages of which were busy with 70’s style illustrations of dogs and bears cooking up a storm. The book itself is long gone, discarded I suppose at some point with all those other books from childhood that I mistakenly thought I would no longer want. This cake, however, has stayed with me, never far from my thoughts. An invaluable part of my repertoire, for those times when what you want is a proper tea-time cake. Not something that could be pudding, nothing with any pretensions to modernity, but a good old fashioned cake that was made to be taken by the slice (and I defy you to stick at one slice) with a cup of tea and friends mid-afternoon. It goes without saying that it being taken from a children’s recipe book means that it is fabulously easy to make too. Put the butter and caster sugar in a bowl and cream with a wooden spoon. Add the eggs to the butter mixture one by one, beating each time until smooth. Then add the coffee and mix that in too. It may seem odd to be adding coffee granules, and you could use coffee essence if you prefer. But trust me that this works, the result is not at all bitter and there is something right about a coffee cake flecked with dark grains. Sift the flour and fold into the mixture. Spoon it out into your two cake tins and put into the preheated oven. Bake for 20-25mins, until a skewer comesout clean. Put the cakes to cool in their tins onto a wire tray. To make the icing sift the icing sugar into a bowl. Put the butter, caster sugar and water into a pan on the stove and melt. Bring the pan of ingredients to the boil and pour over the icing sugar. Add the coffee and beat well with a wooden spoon to get rid of any lumps and allow most of the coffee granules to dissolve. Leave to cool a little, during which time it will thicken up to a spreadable consistency. When the cakes are cool, spread the icing equally between the layers and on top of the cake. 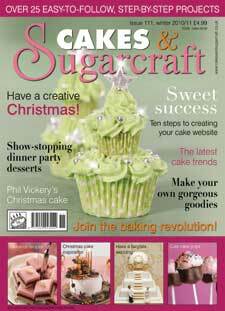 This article first appeared in Cakes & Sugarcraft issue 111.